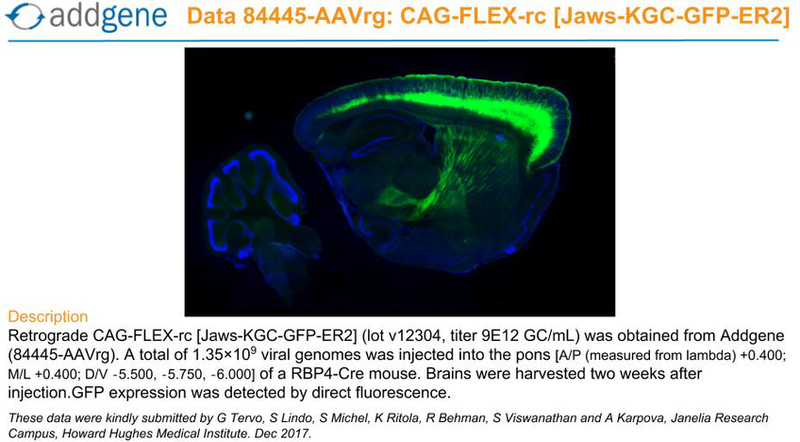 AAV-mediated expression of Jaws-KGC-GFP-ER2 under the CAG promoter, in floxed/reversed (Cre-dependent) manner. Can use Stbl3 at 30°C (use carbenicillin if using Stbl3) or DH5a at 37°C. Ready-to-use AAV5 particles produced from pAAV-CAG-FLEX-rc [Jaws-KGC-GFP-ER2] (#84445). 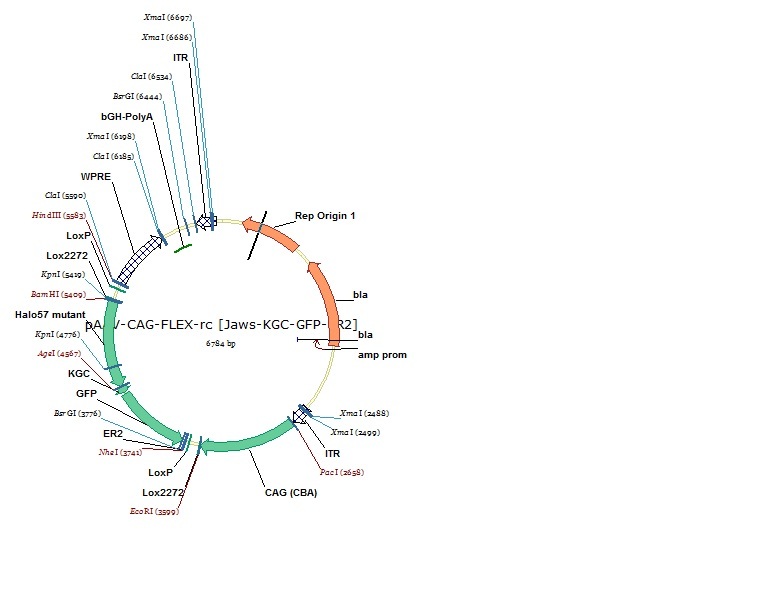 In addition to the viral particles, you will also receive purified pAAV-CAG-FLEX-rc [Jaws-KGC-GFP-ER2] plasmid DNA. 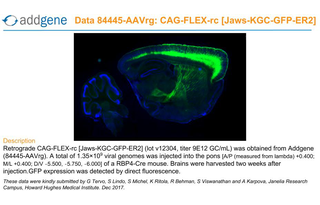 CAG-driven, Cre-dependent Jaws-GFP for optogenetic inhibition. These AAV preparations are suitable purity for injection into animals. 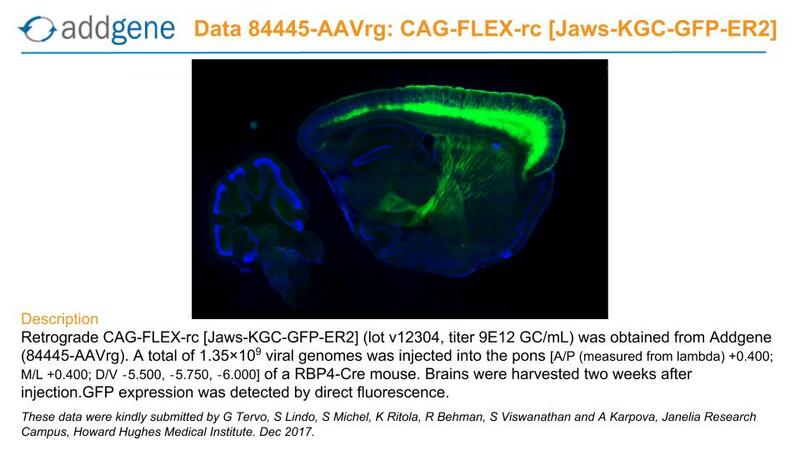 Ready-to-use AAV Retrograde particles produced from pAAV-CAG-FLEX-rc [Jaws-KGC-GFP-ER2] (#84445). 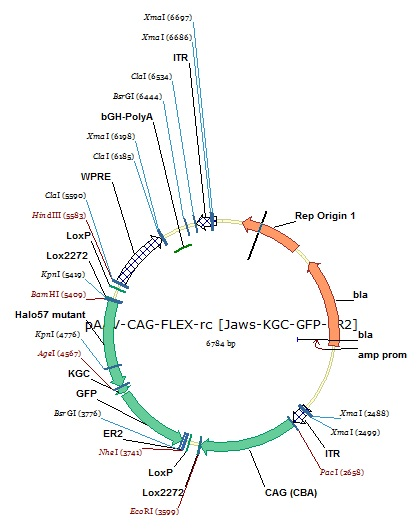 In addition to the viral particles, you will also receive purified pAAV-CAG-FLEX-rc [Jaws-KGC-GFP-ER2] plasmid DNA. 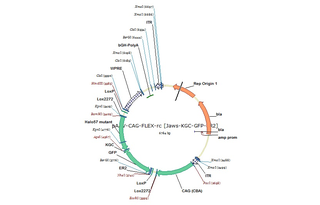 CAG-drive, Cre-dependent Jaws-GFP for optogenetic inhibition. These AAV were produced with a retrograde serotype, which permits retrograde access to projection neurons. These AAV preparations are suitable purity for injection into animals.